As Barack Obama and Mitt Romney prepare for their first debate on Oct. 3, the issues at the top of the voters’ agenda have changed little since 2008. Fully 87% of registered voters say that the economy will be very important to their vote, while 83% say jobs will be very important to their vote. Four years ago, the economy also was the top priority for voters. In August 2008, an identical 87% said the economy was very important to their vote, and in October 2008, 80% rated jobs as very important. However, the latest national survey by the Pew Research Center for the People & the Press, conducted Sept. 12-16 among 3,019 adults, including 2,424 registered voters, finds that several other issues have declined in importance since 2008. Most notably, energy policy rated among the most important electoral issues in 2008 – 77% said it was very important to their vote. Today it ranks near the bottom of the voting priorities list at 55%. Terrorism also has declined as a voting priority. 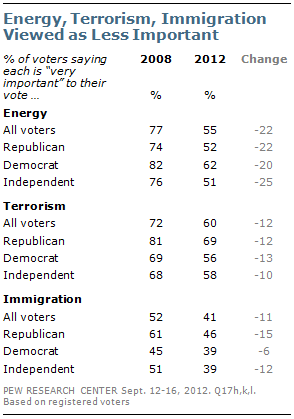 Currently, 60% of voters say the issue of terrorism will be very important to their vote, down from 72% in August 2008. Immigration is also less of a focus in 2012. In the new survey, 41% view the issue of immigration as very important – the lowest of 12 issues tested – compared with 52% in August 2008. The survey also finds that far more voters continue to favor a smaller government with fewer services than a bigger government that provides more services. Currently, 56% say they would rather have a smaller government providing fewer services; 35% prefer a bigger government. These opinions have changed little over the course of Obama’s presidency. In October 2008, however, opinion was more evenly divided (46% smaller government vs. 40% bigger government). In addition, while the budget deficit remains a very important issue for most voters, there continues to be broad agreement that the best way to reduce the budget deficit is with a combination of tax increases and cuts in major programs. In the new survey, fully 69% of registered voters say the best way to reduce the federal budget deficit is with a combination of tax increases and spending cuts; just 16% say the focus should be mostly on cutting major programs and just 6% say the deficit should be reduced mostly by increasing taxes. 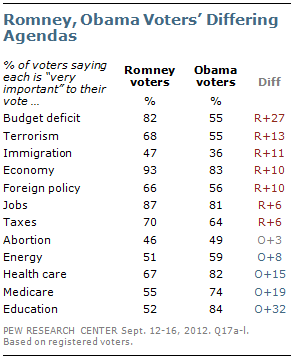 There are substantial differences between the priorities of voters who support Romney and those who back Obama. Eight-in-ten Romney voters (82%) say the budget deficit will be very important to their vote, compared with 55% of Obama supporters. That is a reversal from four years ago; in May 2008, more Obama voters (77%) than supporters of John McCain (60%) said the budget deficit was very important to their vote. The Pew Research Center’s annual public priorities surveys have found that the party out of power tends to place greater importance on the budget deficit than does the party that controls the White House. 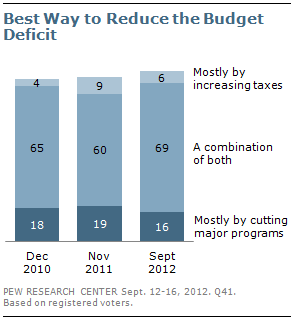 In January 2012, 84% of Republicans and 66% of Democrats viewed reducing the budget deficit as a top priority. Four years earlier, at the start of George W. Bush’s final year in office, more Democrats (64%) than Republicans (52%) said the reducing deficit was a top priority. In the current survey, Romney supporters also are more likely than Obama voters to view terrorism (by 13 points), immigration (11 points), the economy (10 points) and foreign policy (10 points) as very important to their vote. And while jobs rank near the top of the agenda for Obama voters, more Romney voters rate the issue of jobs as very important (87% to 81%). Taxes also are viewed as very important by somewhat more Romney voters (70% vs. 64% of Obama voters). 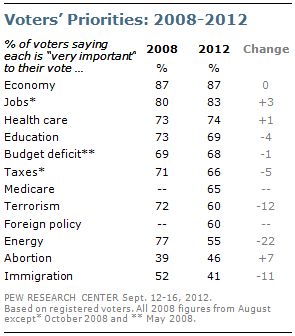 Education, Medicare and health care rate as far more important priorities for Obama voters than for Romney voters. More than eight-in-ten Obama supporters (84%) say education will be very important to their vote, compared with 52% of Romney supporters, and there also are sizable gaps over Medicare (19 points) and health care (15 points). Roughly one-in-five voters (22%) are considered swing voters, either because they are undecided or haven’t fully committed to Obama or Romney. For the most part their priorities are in line with those of all registered voters: Fully 85% of swing voters view the economy as a very important voting issue, followed by education and jobs (74%). Abortion rates as a less important issue among swing voters than among all registered voters. Only about a third (34%) of swing voters say abortion is very important to their vote. 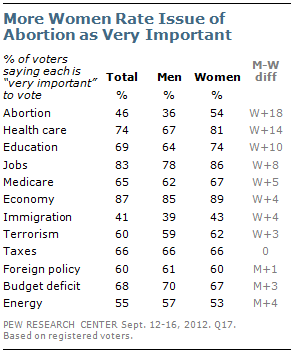 Nearly half of all voters (46%) say abortion is very important. Women are far more likely than men to rate several issues as very important, including abortion and health care. More than half of women (54%) say the issue of abortion will be very important in their voting decision, compared with 36% of men. And while 81% of women voters say health care will be very important, fewer men (67%) view that issue as very important. Women also are more likely than men to view education (by 10 points) and jobs (eight points) as very important. There are no issues that significantly more men than women rate as very important. While women view abortion as a more important issue than do men, there is no indication in the survey that is having an impact on the vote choices of women. In the new survey, women favor Obama over Romney by a wide margin (56% to 37%). Obama’s advantage is about as wide among women who view abortion as very important (58% to 37%) as among those who view it as less important (53% to 36%). Medicare rates as a much more important issue for older voters than younger voters. More than eight-in-ten (83%) voters 65 and older view the issue as very important to their vote, as do 69% of those 50 to 64. Among voters younger than 50, just 55% rate Medicare as a very important issue. Older voters who rate Medicare as a very important issue support Obama by a substantial margin. Among all voters 50 and older, Obama and Romney run about even (48% Obama vs. 44% Romney). 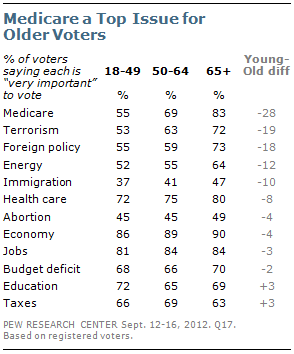 But voters in this age group who view Medicare as very important support Obama by 54% to 39%. Among the much smaller group that views the issue as less important, Romney leads, 59% to 33%. Energy emerged as a major issue during the 2008 campaign. In August, as gas prices surged, 77% of voters said the issue of energy would be very important to their vote. Currently, just 55% view energy as very important. Just 52% of Republican voters now say energy is very important, down from 74% four years ago when the phrase “drill baby drill” became a political slogan at the 2008 GOP convention. The declines have been comparable among independents (25 points) and Democrats (20 points). Similarly, since 2008 terrorism has declined in importance among Republicans (by 12 points), Democrats (13 points) and independents (11 points). Republicans (69%) remain far more likely than independents (58%) or Democrats (56%) to view terrorism as very important. Four years ago, a majority of Republican voters (61%) said that the issue of immigration would be very important to their vote. That has fallen to 46% in the current survey. Fewer independent voters also rate the issue of energy as very important than did so four years ago (51% then, 39% today). There has not been a significant change in opinions among Democrats over this period (45% very important then, 39% today). Views about the size of government have long been linked with voting preferences. But these opinions are now more correlated with the vote than in previous election cycles going back to 1976. 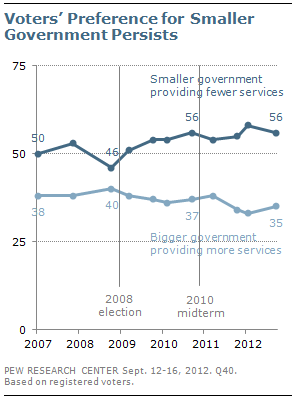 Among voters who favor a bigger government providing more services, 83% support Obama and just 12% back Romney. Those who would rather have a smaller government providing fewer services support Romney by more than two-to-one (65% to 29%). The Pew Research Center’s long-term study of political values, released June 4, found that the largest divides between Obama supporters and Romney supporters were over the scope and role of government in the economic realm, and that the partisan divides over these and other values continue to grow.